Ranjit has been an eminent and leading Indian Hosiery brand in the market for more than 40 years now. Over the years, our quest for unparalleled quality has helped us distinguish ourselves. This quest is inspired by the ambition to extend the horizons of comfort through human's most basic drape, the inner wears. Besides innerwear, the brand also manufactures and exports Cotton Hosiery Garments, Knitted Garments and Kidswear.At Ranjit, we pay attention to every small detail in order to produce top quality products whether its 100% combed cotton yarn, finest knitting threads, imported machines or skin friendly bleaching and dyeing procedures. 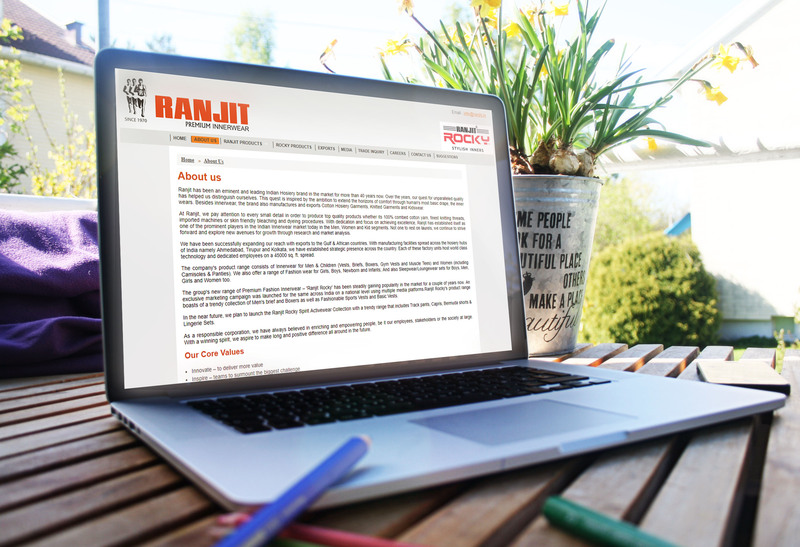 With dedication and focus on achieving excellence, Ranjit has established itself as one of the prominent players in the Indian Innerwear market today in the Men, Women and Kid segments. Not one to rest on laurels, we continue to strive forward and explore new avenues for growth through research and market analysis.We have been successfully expanding our reach with exports to the Gulf & African countries. With manufacturing facilities spread across the hosiery hubs of India namely Ahmedabad, Tirupur and Kolkata, we have established strategic presence across the country. Each of these factory units host world class technology and dedicated employees on a 45000 sq. ft. spread.